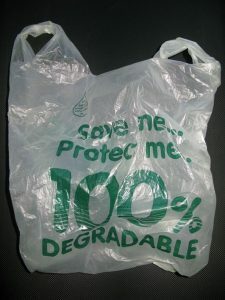 Biodegradable plastic  products are often perceived as a potential solution to plastic littering and have attracted increasing public attention. According the Green Paper on a European Strategy on Plastic Waste published by the European Commission, the term “biodegradable” itself may be misunderstood by customers. The large majority of biodegradable plastics can only biodegrade under very specific conditions of constantly high temperature and humidity in industrial composting installations and are neither fit for home composting nor do they decompose in reasonable time when littered. Confusion could cause consumers to take insufficient care in their disposal out of a misunderstanding that objects labelled as biodegradable would decay within short time periods under natural conditions. 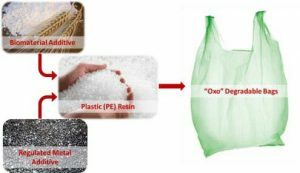 Oxo-degradable plastics are widely used in Montenegro and might risk contributing to the microplastics load reaching the marine environment and therefore might significantly increase the risk of ingestion by animals. Another open question is the extent to which biodegradable plastic can be a solution to plastic marine pollution. 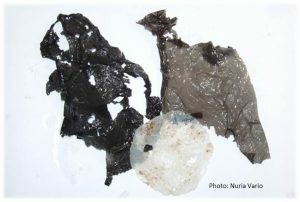 Many biodegradable plastics may not degrade in the intestines of marine species and injury is likely to remain an issue. The presence of oxidising agents in the plastic waste streams may also make plastic recycling more difficult. It should be assessed whether the use of the term biodegradable is at all permissible in this case. Waste treatment systems already in place are not yet capable of separating sufficiently biodegradable plastic from conventional plastic which can jeopardize recycling processes, the multitude of additives used in plastic production can be a major obstacle for plastic recycling or lead to more “down-cycling” than cradle-to-cradle recycling. The solution? A ban on single-use plastic bags (you can sign the petition here) and the use of reusable bags made of (organic) cotton or recycled materials (ex: RPET) instead of any single-use plastic bags. Biodegradable plastics shall be understood as plastics that can be degraded by living organisms – in particular microorganisms into water, CO2, methane (CH4) and possibly non-toxic residues (i.e. biomass).